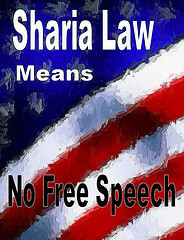 “the rise of Sharia law“? No women drivers, no gay parades, no ham & cheese, no prom night, no alcohol -basically no rights at all. Okay, I’ll take a stab at it. Political correctness and appeasement? Ya think? What the city of Dearborn and Wayne County are afraid of is the anticipated roudy behavior of Dearborn’s Muslim population. Can you blame them? No, but this still does not justify stripping Jones of his constitutional right to free speech. What about the rallies held by the Congress of Arab American Organizations all the time at the Dearborn city hall supporting Hezbollah and its rocket attacks on Israel? Are they denied this assembly of free speech? The answer is No. The bond Jones and Sapp refused to post, a seemingly symbolic $1 bond came with conditions prohibiting Jones from going to the mosque or adjacent property for three years. But the other thing I cannot understand is how they put a jury together so fast. I’m not sure Jones could get a fair trial in Dearborn with its huge Muslim population. “It is unconstitutional for the government to put a price on free speech in anticipation of what others may do,” said Rana Elmir, a spokeswoman for the ACLU of Michigan. Freaking unreal! Drip, drip, drip down the drain goes our freedom.